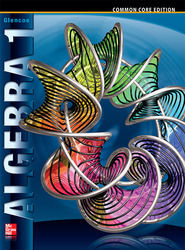 The only program that supports the Common Core State Standards throughout four-years of high school mathematics with an unmatched depth of resources and adaptive technology that helps you differentiate instruction for every student. Connects students to math content with print, digital and interactive resources. Prepares students to meet the rigorous Common Core Standards with aligned content and focus on Standards of Mathematical Practice. Meets the needs of every student with resources that enable you to tailor your instruction at the classroom and indivdual level. Assesses student mastery and achievement with dynamic, digital assessment and reporting.